Make this beautiful crochet brooch from Alla Koval with this free crochet pattern. It makes a great accent to a purse or a piece of clothing. DMC Traditional crochet thread is used. For more beautiful handmade flower projects, check out our collection of 53 Printable Flower Patterns. NOTE: Many roses and leaves can be made from a single ball of thread. NOTE: See Diagram 1 on p. 4. Row 1(RS): dc in 5th ch from hook, dc in each ch across, turn = 73 dc. Row 2: ch 1, sc in 1st dc, [sk 2 dc, 8 dc in next dc, sk 2 dc, sc in next dc] 3 times, [sk 3 dc, 12 dc in next dc, sk 3 dc, sc in next dc] 3 times, [sk 4 dc, 15 dc in next dc, sk 4 dc, sc in next dc] 3 times. Fasten off, leaving 8-10” yarn tail. Make one with pink, one with baby pink and one with • turquoise. NOTE: See Diagram 2 on the right. Row 1(RS): sc in 2nd ch from hook, * hdc in next 2 chs, dc in next 3 chs, tr in next 3 chs, dc in next 3 chs, hdc in next 2 chs, * 3 sc in last ch; working in free loops of beg ch, rep from * to *, sc in next ch, do not turn. Row 2: ch 1, sc in beg ch, sl st in next 15 sts, (sl st, ch 3, sl st) in next sc, sl st in each st across to beg ch. Fasten off, leaving 8-10” yarn tail. NOTE: See Diagram 3 on p. 4. With green ch 4, join with sl st in the 1• st ch to form a ring. Rnd 1(RS): ch 1, 7 sc in ring, join with sl st in beg ch = 7 sc. Rnd 2: ch 1, 2 sc in each sc around = 14 sc. Rnd 3: ch 1, [2 sc in next sc, sc in next sc] around = 21 sc. Rnd 4: ch 1, [2 sc in next sc, sc in next 2 sc] around = 28 sc. Rnd 5: ch 1, [2 sc in next sc, sc in next 3 sc] around = 35 sc. Rnd 6: ch 1, [2 sc in next sc, sc in next 4 sc] around = 42 sc. Rnd 7: ch 1, [2 sc in next sc, sc in next 5 sc] around = 49 sc. Fasten off. Foll tutorial (• see p. 4) form a Roses bouquet. Sew safety Catch Brooch back to center of Pin Base. TIP: Brooch Back also can be glued (hot glue is recommended). Weave in ends. I love these beautiful flowers! There are so many possible ways to use them, I cant wait to make a bunch for different projects. These would look great as a hair bow or a brooch. They would also be awesome on a bag, just a little something to add something pretty to an otherwise bland project. I have been trying to make flowers for Mother's Day corsages, but had not thought about how I was going to put them together. I guess I thought I'd figure that out when I got that far. Now I don't have to worry! It's all right here! Thanks so much. TOO CUTE!!! added these darling flowers to each sq. in the "toddler quilts" that I made for my grand daughters. Too Cute ! I absolutely vote for this one! Just beautiful, and easy, too! And so versatile as well. You can be really creative with this, and use different colors (tho' I love these colors), and you could even mix these crocheted roses with some ribbon roses--the sky's the limit! Thank ya'll for all of your good patterns and accurate directions--I come to your website whenever I need more crochet inspiration! I like this pattern. Very delicate. I think that the pastel brooch is very beautiful!!! Very pretty. Can be used in so many ways - as a hair ornament or pinned on a purse or tote, on a sweater, on a dress...or even to top a birthday present instead of a bow. I could picture a vase full of these in my craft room. I love this pattern! It looks so delicate & elegant! my vote go to the lovely roses, they are realistic looking. Dainty. Good for all ages of ladies. Changing colors for special events would be very easy. Excellent little gift. I think this brings to mind, Spring rather than the calla lily making one think of a funeral or a memorial service. CallaLilies make me think of my mom and dad's wedding and my sister's wedding. My mom and sister both carried bouquets of CallaLilies. CallaLillies are also symbolic of our Lord's resurrection. Both far from funereal. I vote for this pattern. You could do different colors for different ocassions. It is small and compact. I like that. I really like this pattern because it can be used in so many different ways, as a pin, decor on a hat, or on a stuffed animal or on a little girl's dress. This would be my pick. So cute. Rosebud pattern is my pick. I like both but think I could use the rosebuds for many different purposes to add color to an outfit. The three color combination is always catchy to the eye too. I agree, both are very nice; but the roses look more durable. They are both very nice! I liked the roses as they looked to be easier to apply to other itemss. I liked both brooches, but the roses looked like they would stand up better to most applications. Lovely, would go well on a knitted or crocheted hat. Wonderful Spring addition to any number of items! I love pins, but I do like the ideas of headbands, on a purse or tote! Looks fun, quick and best easy. I would consider different colors. Pastels are the wrong colors for me. I would choose some earth toned colors like dusty rose and mauve and plum and a more earth toned green for the leaves. Then add those to a hat or something. It would take the gaudiness right out of it and match better with the projects. The colors are great for the ideas I read so far for bridal bouquets and such, since the pastel colors are spring and summer colors. Cute and versatile. Definitely cute for girl's headband, "wrist corsage" bracelet, etc. For adults, not so much my style, but would be cute on certain hats, etc. I have this pattern & have made quitea few using it & I will continue to use this pattern in my future projects. I enjoy crocheting flowers & leaves. I would. Homemade items are so nice to have. I like these roses better than the pattern I have been using. I will be making some and attaching to haircombs to wear in my hair like the others I have made. I would! I have used patterns like this to make bouquets for my 20th wedding anniversary when we renewed our vows. They came out great, cost less, and made the event that much more special for my attendants and us. I always watch for patterns for different flowers now. Yep, planning to make a whole bouquet of these! Oooooh yes......would be wonderful on a purse.....or used to close a sweater or maybe on a shawl. I am very new at crochet so I might try this out with a larger hook and yarn. I think it would look adorable attached to a hat! I am excited to try out the triple rose coursage. With a wedding this spring in the family, this may be an idea for the shower favors. Thankyou for the many crochet patterns you offer for free. I would absolutely make this. It could be used for many things...brooch,as a in place of a bow on a wrapped gift,embellishment for a hat/scarf etc. This is a very lovely brooch ! I haven't hesitated making it. It will make a special gift for a special woman/girl. Birthdays Mother's Day or just to make someone feel that they are, in deed, extra special. Can be given to anyone of any age. Colors can be changed according to the person's favorite flower colors. Mine would definitely be several different shades of red. A quick, easy gift to enjoy making and giving !!! What about making some of these up and taking them to a nursing home to be given to their clients. I think that would brighten up anyone's day. Or what about using them for a mother-daughter banquet? I think this is a great project quick and colorful! Love this.. will probably make a lot of these for family & friends. Would not make this. Too gaudy for my taste. I think it's pretty as a brooch and like the other comments it would like nice for all different ideas. It is not too advanced but I do not think it makes a fashion statement and would not use it as a brooch. I think it may look nice on a knit or crocheted hat possibly. love this brooch,I have made similar flowers for tote bags and hair accessories! Yes. It will look cute on a t-shirt, sweat shirt, or even flip flops --- not just a brooch. Yes I will make this brooch. 4girlsmommy has a wonderful idea. I made something similar to this and it was easier than it looks. I actually made a bouquet to leave on my grandmother's grave. She taught me to crochet and I thought it was more appropriate than real flowers. I made a bouquet for my mother as well for Mother's Day and sprayed them with a floral perfume. I would definately make this. I would certainly make this pin. It is very pretty and I like JMitchell, need only to locate the colors I am interested in using. I printed the pattern to OneNote and plan on making it soon. Yes, I'd make this. I saved the pattern and now need only locate enough thread in realistic colors. I could wear it as a broach with several outfits or attach it to one or more of my accessories. I would keep the attachment method via safety pin or other temporary method so the broach could be saved from damage when clothing gets washed. I really like this. I think I could do this. And I can think of uses for it. Thanks for featuring it. Its a cute little pattern. Doesn't look very difficult to make, and I like that it doesn't take much thread. I think it is beautiful. I plan to make this for my 2 daughter-in-laws. Finally! Something that I would actually crochet on the "to crochet or not to crochet" section of the newsletter. I would attach this to my purse and change the colors to a darker tone. I think attaching brooches to a purse or a pair of boots is a super fun way to make a subtle change to the look of your outfit without changing a whole lot. I mean who LIKES to switch out purses all the time?! I love this pattern! I love this pattern! I will make it tonight. Not too advanced for me. These roses would look adorable on a child's headband, (along with embroidery) on a little girl's dress, or even on a crocheted afghan or lapghan! 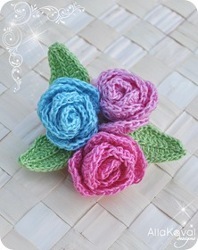 I would love to make these roses for my granddaughters. They wear lots of flowers in their hair. I would like to sell them to other little girls. I would make this for my granddaughters, they love flowers on anything. Yes, I would make it however, it's not what i would call "pastel" . When I make it, I shall choose mossy soft colors and make a bouquet for my home. It's a sweet little flower. I actually love the Pastel Brooch and I would wear it any day, any where, no matter what I was wearing. I love to crochet and I am proud to make and wear some of the things that I make. The diagrams & the rest of the instructions can be found under the material lists by clicking on PATTERN. Hope this helps! Have already made the roses and they are beautiful but the directions are incomplete as they do not tell you how to put them together. It simply refers you to page 4 of the tutorial whatever that is. Can you help!!? You have (notes and see p.) but no way to access this helps you are giving. and ring and purse shoud not leave this site. I like this pattern. They can be done in different shades to match your outfits. Another idea is to sew them on "scrunchies" type hair ties, for a beautiful hair accessory you would be proud to wear and show off. This idea would also be a wonderful gift idea for someone that is hard to shop for. Happy crocheting.